Born 1950 in Clarke County, now lives in Nada, Powell County, Kentucky. Our first experience with Carolyn Hall and her husband was at the 1993 first annual "Day in the Country" held in back of Charlene and Clete Ferguson's Bed and Breakfast located in Sandy Hook, Kentucky. The Ferguson's were gracious hosts to this seminal event allowing us privileges afforded to those who stayed in their home, while we slept in our Volkswagon camper van. Clete even shared some local moonshine the Friday night before the event, a true sign of hospitality. Saturday morning Charlene served a bountiful breakfast with biscuits the size of "cat's heads" while the artists began to set up their booths. It was a steamy June morning with a certain sultry afternoon to come. Among the artists we expected to be represented was Carolyn Hall. We recognized her work because although it resembled the work of her "teacher" and friend Carl McKenzie upon inspection, it portrayed unique features and style. Carolyn had grown up near the Nada home of Carl McKenzie and his wife. After her death, the Hall family took McKenzie into their home. During this time, McKenzie taught Carolyn to carve and later gave her his carving knives and tools. She became his care taker and after his stroke, while he lived in a nursing home; they remained close until his passing. 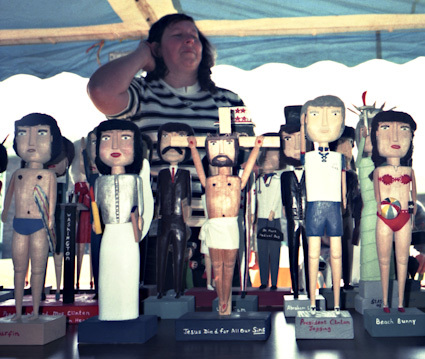 Carolyn's work is typically made from pine or basswood. 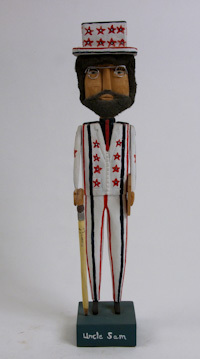 Like Carl McKenzie her carving is figural, economically about 16" tall, and painted with acrylic paints. One of the features that is different about her work than McKenzie's is her use of cotton, then painted, as hair. 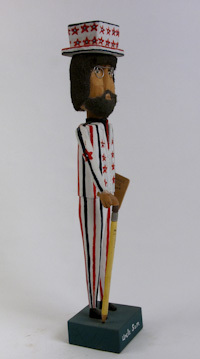 She carves figures from popular culture including musicians, baseball and basketball players, as well as presidents and politicians.